Good morning Nosh Show listeners! 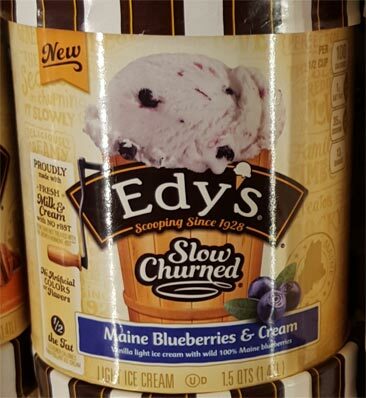 To celebrate Episode 72, I discovered some new flavors from Edy's / Dreyer's Slow Churned line. I've been complaining for awhile that they have just been recycling their limited edition flavors, so imagine my surprise when I stumbled upon these. Now I don't know if there will be more than 5 7 "new" flavors, but we've got an interesting start. Update: Thanks to Carla for letting us know that she called Dreyers's and they said that there will also be a Oregon Black Cherry flavor and California Almond Crunch flavor (caramel light ice cream with 100% California almonds and a caramel swirl). First up we've got the return of one flavor and the... similarity to another. I haven't had Apple Pie since 2008 but I saw a few reviews from 2010 which reminded me that it available as one of those single size containers. Edy's has already got Mud Pie flavors but Bobby reminded me in the comment section that those have coffee bases. I just had a thought. Just like the new Haagen-Dazs destination series, all of these flavors have a state in their name. That can't be a coincidence. Let's call these the Edy's Destination Series... nah, The Edy's Road Trip Series. Read the Pecan Pie description again, it's kind of ingenious. 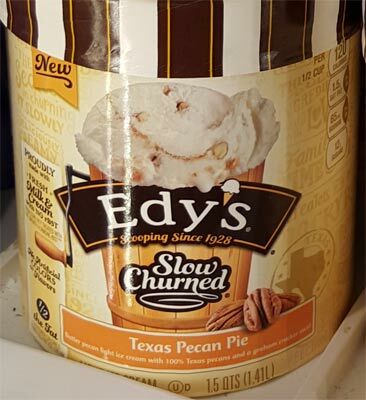 You take you're regular butter pecan, make sure the pecans are from Texas (didn't realize this was a thing), and then add a graham cracker swirl. I'm guessing Nick will be pretty stoked for this one. Blueberries & cream doesn't excited me at all. I mean, how immensely rare is it to get a blueberry flavor that doesn't taste like junk? No, wait, I take that back. The premium companies can do a nice job with it, I just get scared when it's a main stream product, especially a light ice cream one. Lastly is the Maple Syrup one which might be fun. Yes, it might be overly sweet, but it has maple toffee pieces and that sounds an awful lot like a respectable Hood flavor I have in the review queue. You know, all but mud pie has 100% of something in it. Couldn't they import Mississippi fudge or something? I guess I should be grateful that they didn't import real Mississippi mud. Yes, I said it. Yes, I know it sounds dumb. No, I couldn't resist. Yes, I looked up that mud pie probably originated in Mississippi. So, in the comments, which ones would you try? Are you stoked Mud Pie is back? 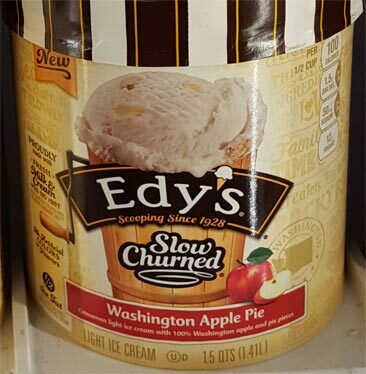 Do you remember the original limited edition Apple Pie flavor? Any other thoughts? As always, have a good week everyone! That's right, we finally get a Rolo flavor in the states! Update #2: While I had hoped Edy's frozen custard would go quietly in to the night, it is instead going to be joined by two new flavors: Butter Toffee Brickle (buttery toffee custard base with chocolatey coated butter almond toffee pieces and fudge swirls) and Raspberry Cheesecake (sweet cream custard with cheesecake pieces and a raspberry swirl). --- early July note: these are hard to find, I'm trying to remember if I've even seen them yet. Once maybe? Edy's is like the watercolor of ice cream. If I'm going to eat something that indulgent and unhealthy I need stronger flavors. 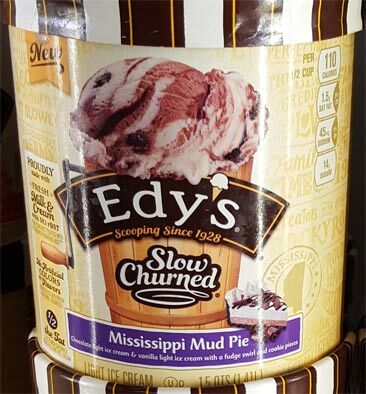 @Nathan: I don't think I would call Edy's slow churned line up "indulgent"
Our local stores do still have the original Mud Pie, but it's a mocha coffee kind of thing, with the cookie pieces. I love it -- so I hope they don't drop it because of the new Mississippi one. Still, all of these new flavors do look awesome and delicious!! @Bobby: thanks for the reminder! post corrected! None of these flavors particularly stick out to me as something I MUST try like some of the recent releases by Turkey Hill and Ben & Jerry's, but I'm always excited when new flavors come out because that means more reviews! I'd be more interested in the Apple Pie than the Mud Pie, but that's just me. Maple! Maple and vanilla are delicious together and not used enough in ice cream. I'll be looking for this one. Apple pie 2nd. 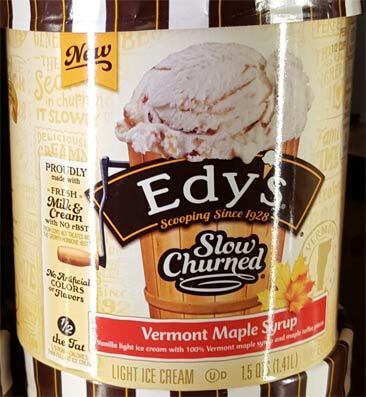 Any idea if other Slow-Churned flavors are being dropped and/or whether there will also be Grand versions of these flavors? The aforementioned "recycling" of limited edition flavors have (or at least had: I haven't looked this year) had Slow-Churned and Grand versions. Nothing I'd camp out for, but I will try the first three flavors (not a big blueberry fan, and I don't like nuts in ice cream). MMP sounds like a nice, simple flavor; Blue Bunny came out with a pretty good Apple Pie over the holidays that has whetted my appetite for the flavor, and I'm almost always a big fan of cinnamon ice cream; not a big toffee fan, but the syrup is intriguing. As always with Dreyer's/Edy's (particularly the slow-churned), the issue is how much mix-ins there are. Would be nice if the Dreyer's/Edy's website was updated, though maybe that's just standard, as B&J's hasn't listed any of the new core flavors like the Cheesecake one (the newest flavors I see are the non-dairy ones). I actually called Dreyers because I wanted to know when any of my local stores will be carrying these flavors and I found out that there are two more that haven't been mentioned here! California Almond Crunch and Oregon Black Cherry will also be featured in the lineup. HA! Now that would be something to see! Baked Alaska! Florida Orange?? I just saw that impulsive buy posted a bunch of new edys ice creams with nestle candy mix ins. Assuming they are ice cream vs frozen dairy dessert, they could be quite good. Hope you or nick will review some! Yup, the guy who submitted those photos pinged me as well. I'm pretty stoked as Canada has had a rolo flavor for years now. The maple one is delicious, I got it at Target on Friday and it especially made a great milkshake. And I grew up in Texas and we had a pecan tree in our yard that we were always eating fresh pecans from, so yes, it is a Texan "thing." I'll look for that flavor next, and the apple pie and cherry ones. A Pecan treat in your yard? COOL! I was in krogers yes i bought the apple pie yes i have tried it. So good. They really should go the mile and do all 50 states. Someone tell me what you think they would do for Illinois you say corn spank yourself and what they would do for Indiana if you thought NASCAR what flavor is that? We have nothin special food eise in IN. Ohio would be buck eye flavor plain ice cream with chunks of buck eye candy in it. Holy cow - it's great! Not too sweet, with a hint of burnt toffee and cream taste. Just lovely. My husband will hate it as it has a swirl. Fine - more for me!